If you’ve been wondering what the hell’s going on in the world of Cairns Unlimited, so have we!!! I swear I have never been so busy in my life. Since our last blog entry, we have bought a new car (well, second hand, but new to us! ), moved into a new home on Cairns NORTHERN BEACHES, and are just about to set off on a two week road trip around the NORTHERN OUTBACK. You can probably imagine that a 3000 kilometre road trip through the Australian outback has taken a certain degree of planning and preparation, and that’s the best excuse I’ve got for our recent silence. If you’re interested to see where it is we’re heading, click on the map below to open an interactive map of the Northern Outback. We will probably drive west for about five days to visit NORMANTON and KARUMBA; BURKETOWN also if our van is feeling up to the drive. Then, we’ll turn south to CLONCURRY - the hottest place in Australia - and check out one of Australia’s most important mining towns, MOUNT ISA, while we’re there. Then, it’s back to the coast via the OVERLANDER’S WAY - another four or five days - ending up at TOWNSVILLE, before we wind our way north again, through the CASSOWARY COAST. It will be great to get away, after the last three months (and a considerable amount of time before that!) almost chained to the computer. But it will be great to get home, as well, to our new townhouse on the beach. 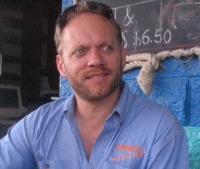 Ah, life in Tropical North Queensland… beautiful one day, perfect the next! Did someone already say that? By the way, Maria was looking for cheap flights on the internet recently; for ourselves to visit South Queensland at Christmas, but also in case some of her friends are planning to visit… now that we have a townhouse with a swimming pool… right on the beach! Well, guess where she found the cheapest flight? Right here on Cairns Unlimited!! If you’re looking for a cheap flight from almost anywhere in the world to almost anywhere in the world, you won’t do better than use our FLIGHT FINDER, which allows you to compare all the major discounters by entering your details just once. More big things… a gumboot, a mudcrab, what next?? Weekends aren’t the best time to be campaigning, as we discovered quite early in the day. Most of the businesses we visited today were staffed by part-time employees who don’t handle marketing decisions. Managers were generally at home with their families for the weekend. But still, we gave our speal with enthusiasm, left our business cards at each place and pressed on with the road trip undeterred. In TOWNSVILLE, we visited a number of backpackers hostels, hotels, motels, holiday apartments and restaurants, as well as a couple of the major tourist attractions. We have been growing increasingly anxious to reach CAIRNS. Although we only left Brisbane five days ago, it feels like we’ve been on the road for weeks. Living out of a backpack once held some sort of romantic appeal for me, but when you’re a week or two away from seeing 18 months of hard work come to fruition, the suspense is almost unbearable. There’s only so much we can do with the site from internet cafes. Really, we need to get settled, unpack our computers, and spend a solid day or two updating all the UPGRADED LISTINGS that have been ordered. So we didn’t visit quite as many businesses as perhaps we should have in Townsville, but hit the highway north to the CASSOWARY COAST, a lush coastal rainforest region so-named after the large flightless bird which, although endangered, is quite common in these parts. We didn’t catch a glimpse of the elusive bird, but warning signs every two or three kilometres were a constant reminder that this feathered giant’s fate is largely in the hands of motorists. First stop was Cardwell, where we visited Muddy’s, the restaurant made famous by the GIANT MUD CRAB mounted in its front garden. We were to later regret not dining at Muddy’s, after ordering a very disappointing serve of usually delicious Barramundi from a nearby cafe. Cardwell is a pleasant seaside town, if a little on the sleepy side. 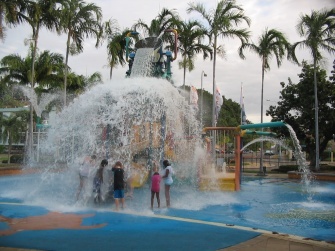 A little further north, TULLY, the wettest town in Australia, presented another one of Tropical North Queensland’s bizzare collection of BIG THINGS. This time it was a 7.9 metre gumboot. 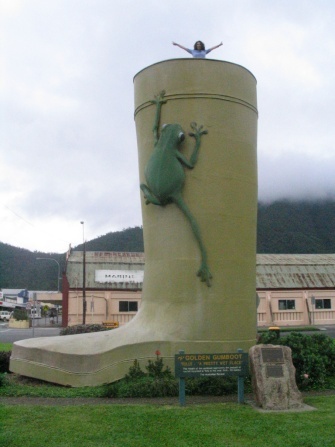 The height of the gumboot reflects the highest annual rainfall that Tully has ever received, 7.9 metres in 1950. In fact, this was not really a freak occurence… the town averages 4.27 metres per year! Our road trip so far had been blessed with perfect weather. But it seemed fitting that the blue skies were to end at Tully. Black-grey clouds clung to the tall mountains just inland of the town, and cascading waterfalls could be spotted near the top of one of the peaks. Still, the rain was sporadic, and really just freshened things up at the end of a humid day. Enthused by the ever decreasing distance to Cairns - now less than 200 kilometres - we pressed on to MISSION BEACH, one of my personal favourite places in all of Tropical North Queensland. We were still doorknocking at 6:00pm, but it became obvious that businesspeople didn’t expect such visits at that time on a Saturday night. Just as Maria and I agreed to call it a day, the van’s headlights fell upon our Holy Grail, SCOTTY’S BEACH HOUSE. This is where we had planned to spend the night, but we didn’t expect to just stumble across Scotty’s so easily… especially after our history of getting lost in every town we encounter. A quick visit to the reception desk, and a short drive to the nearby BOTTLE’O and we were settled in for the night. I stayed here once, ten or eleven years ago, and remembered the place as being about as relaxed and laid back as any hostel I have ever known. As if to prove a point, we discovered a handful of guests, stubby in one hand, rod in the other, fishing for plastic fish in the swimming pool. Scotty’s consists of a large central garden, dotted with palm trees and surrounded by a rectangle of long, narrow buildings with shady verandahs. Our room at Scotty’s was simple but comfortable, and airconditioned, which was a blessing, even in June! Don’t forget that seasons are reversed from the northern hemisphere and June is the beginning of winter. The hostel was buzzing when we arrived, but when the courtesy bus departed for a local nightclub, it seemed like all but Maria and I were on board. We retired to our room with our computers and piles of brochures and business cards spread out on the bed, recording the day’s activities. After a hearty Aussie breakfast of toast and VEGEMITE, we got away from Peta and Bruce’s place mid-morning. First things first, we found an internet cafe in HOME HILL where we could connect with our own computers. So there we sat like a pair of computer nerds, tapping away at our laptops for two hours before we realized there were more pressing things to do than catch up on emails. We visited a few of the local pubs, backpackers hostels, and motels in Home Hill before crossing the famous BURDEKIN BRIDGE to Home Hill’s sister city, AYR, where… just for something different… we visited a few of the local pubs, backpackers hostels, and motels. The response to Cairns Unlimited was good, and the local businesspeople very friendly and receptive, but not quite as enthusiastic as the folks in AIRLIE BEACH. I guess the difference is that we’re now in prime agricultural country, in fact, one of the richest farming regions in the country. Tourism to the Burdekin makes up only a small percentage of their local economy, whereas Airlie Beach and the WHITSUNDAY ISLANDS survive almost solely on tourism. Next stop was TOWNSVILLE, the economic centre of North Queensland, and the largest city in the region. On our approach to Townsville, we were delighted to stumble across the Big Brolga. We already had the Big Brolga listed on our BIG THINGS page, but we had never been sure exactly where it was. 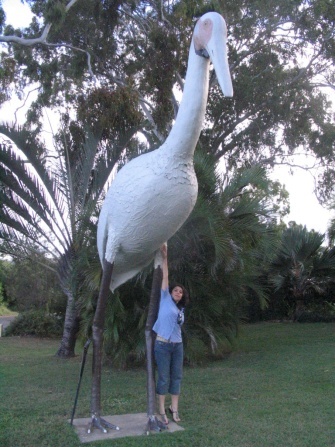 For those of you wishing to sight the six metre bird, you will find the Big Brolga at the tourist information centre, just south of Townsville city on the Bruce Highway. 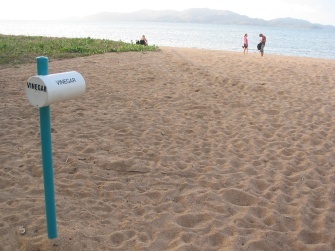 On arriving in Townsville, we headed straight to The Strand, the city’s pride and joy. Adjacent to where we parked the van, there was the most terrific water playground and, even though this country is now officially in winter, the kids were having a rip-roaring time! Note the huge bucket on top of the colourful construction; it fills up with water and every few minutes dumps its load onto the squealing children below. Today’s kids are so lucky… When I was a boy, all we had to play with was dirt…. Wandering north along the Strand, we noticed a rhythmic beat filling the tropical night air. As we approached, we found dozens of people seated in a circle thumping on drums of all sizes and styles. Then I remembered… of course, this was the Full Moon Drum Circle, held every Friday evening nearest the full moon. We had listed it in our TROPICAL NORTH QUEENSLAND EVENTS CALENDAR some time ago, and here we were witnessing it live. Alex, the so-called ‘facilitator’ of the event, was in the middle of the circle, tapping on cowbells, empty water containers, steel drums and apparently anything he could get his hands on. 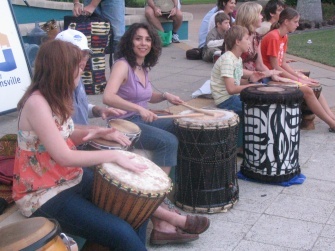 The crowd swelled as evening fell, and one young Spanish girl, whom we all know and love, could no longer resist the hypnotic tarrum-tarrum of the drum circle. But we were trying to control our growling stomachs, and were keen to find a bed for the night. So we bid Alex good night, and set off to find REEF LODGE BACKPACKERS HOSTEL, in Wickham Street, near the centre of the city. After a quick and cheerful checkin, we raced around the corner to the waiting row of restaurants. The choice for tonight? A tasty Thai curry with cocunut rice for me, and spicy Thai chicken noodles for the princess. Another successful day in Tropical North Queensland!